"Yes we received our beautiful "Angel". Our Buddy is very happy in his special "Angel" under a spot light in our library. 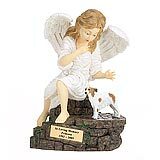 We plan 2 more "Angels" for our Brittany and Chance when the time comes. " 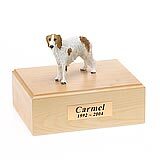 All available Borzoi dog urns and memorials will be displayed with the figurine on the Borzoi urn you select and in the appropriate size.